The Arduino Display Module customizes the ULCD-43-PT Display specifically for interfacing with the Arduino, to provide a quick and easy interface without any wiring hassles. 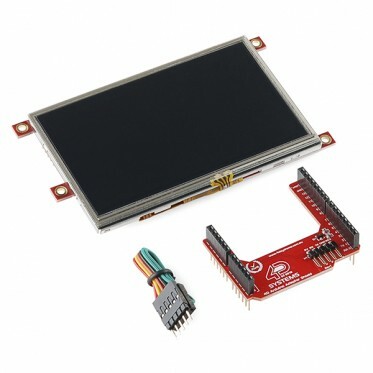 It enables you to quickly connect the 4D Arduino Adapter Shield to their Arduino, connect the 5 way cable between the Adapter and the Display Module, and be connected in seconds to start programming! The ULCD-43-PT-AR has a comprehensive range of serial commands ready to be received from the Arduino, to draw primitives such as lines, rectangles, circles and text, displaying images, playing sound and logging data to uSD card. You can also use the Visi-Genie in Workshop 4 combined with the Arduino Library to create a graphical interface in minutes!